I’ve just realised all the reclassification updates I’ve been doing over the past few days has ended up linking to face book. So, so sorry everyone. Yeh hah, the news we’ve been waiting for. I don’t know if any of you remember what happened when we last applied for work on a cattle station,. What an experience that was. The agency we went through virtually told me the cooks job at Anna Creek was mine, and the manager would phone and confirm it within a few days. That was more than two years ago – and I’m still waiting. Then the mad dash from the NT to the Qld/NT border for similar station jobs, only to be told by email the day we arrived they’d employed someone else literally hours before we arrived. After which getting employment on a cattle station seemed like a bad idea. BUT, about a month or more ago I put a short advert in the Grey Nomads on line magazine asking for work for Paul and I and briefly outlining our skills. I didn’t really expect to get anything worthwhile from it. Least of all did I expect a call from a cattle station. 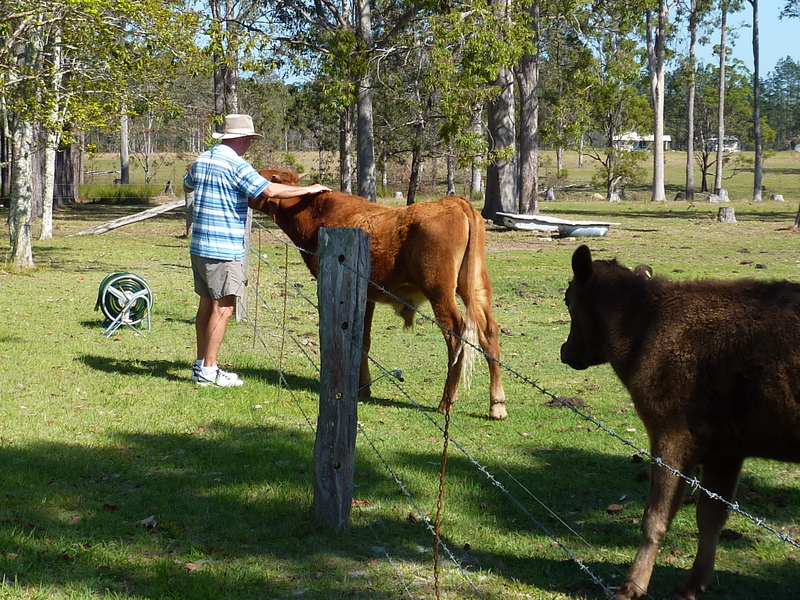 We’d no sooner arrived at Mataranka when we returned from a swim to find a message on the phone from a cattle station. A few days later, and the necessary checks have been completed, and we’re packed up and ready to move off at first light tomorrow, heading back up the road a bit to Queensland and up to the Gulf of Carpentaria. It’s times like this the old Aussie Country Mile comes into play – the ‘just up the road a bit. It’s actually 1700 kms up the road – but that’s nothing in the scheme of things in this big, vast, wonderful country of ours. In fact we’ll leave Mataranka and turn onto the main highway after around three kms. Then we only turn two more corners I think before we turn into the station. I think we’ll hit a couple of sets of traffic lights in Mt Isa , but that’s about it for traffic lights. I guess that’s hard for my UK readers to comprehend. Its what gives Dorothea MacKellar’s poem about this big sun burnt country it’s meaning, all the wide open spaces. I love that poem. For those of you not familiar with the poem, please google it, I think it’s called, My Country. It sums up Australia perfectly. Anyway, details of the jobs are still a bit sketchy. I know I’ll be cooking for around 15. I think Paul is going to be a station hand/handy man. The job will last for the season, and will finish up before the wet season sets in at the end of the year. We’re both excited. Paul will be pleased to be using some of his life/work skills. I think he actually misses his trade, so I think he’s hoping they’ll be in need of some welding repairs around the property, but even just to be out and getting ‘work dirty’ will be good enough. For me, I’m really excited to be getting back into cooking. And I couldn’t think of anyone better to cook for than appreciative hungry men with good appetites. At least I hope they’ll be appreciative, but I’m sure I’ll win them around once they realise I’m not going to poisen them, and they’re going to bed with a full, contented belly. If any of you remember a scene from Forest Gump – the one were Bubba is talking about all the different meals made with Shrimp…. That’ll be me in a few months, only it’ll be beef instead of shrimp. We don’t know the details yet. The station manager will phone us tonight. I do know it’ll be full on, possibly hard, hot and dusty work for Paul, and possible long days for me. I’m sure my feet will feel it for the first week, but after that, I have no doubt I’ll settle into it well. Despite having worked the past 10 – 15 years in the tax office and in office administration, I’ve never felt like an office worker. I’ve always referred to myself as a cook as far as work goes, and I’m really excited to be going back to it. Hopefully it’ll work out well for both us and the station, and as we’re planning to be up in the top end around this time for the next few years, maybe we’ll be invited back. But I’m getting ahead of myself, we’d better wait and see. One thing I know is, Internet and mobile phone coverage is sketchy there. We’ll endeavour to check each at least weekly, and update the blog when time and technology allows. So, please watch this space….. Tomorrow week we’ll be on the plane for Australia, all going well. I haven’t dared think about it in case something went wrong, but all is looking good. In fact, we almost have everything done, and this week have time to spare. Blue skies, wide roads, sunshine and relatively litter free footpaths. Australia we’ve missed you so much. Did I mention blue skies…..
We’re spending our first five nights in Melbourne where we’ll go to the Eagles/Hawthorn footie match. 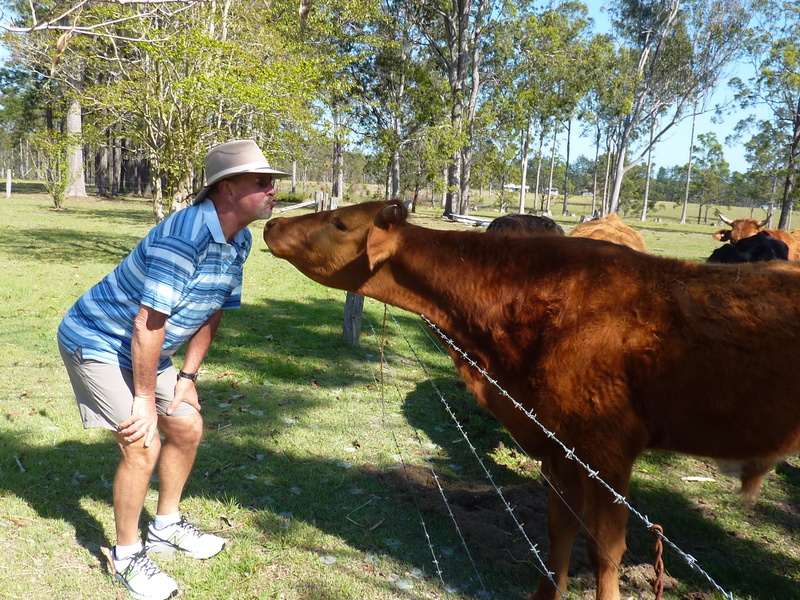 At footie matches in Australia the fans from both teams intermingle. I remember taken a friend to an Eagles match in Perth one day. He had just returned from a couple of years in Europe and was blown away by the friendly intermingling of fans both at the game and outside the grounds. But that’s Australia, we love our sport, but more than anything we love a laugh. Footy matches are usually places were rivalry is in a spirit of good fun. Australia, a country of tolerance. A place where, ‘she’ll be right mate’. Australia – our home. The paperwork for our wheat silo jobs has held up our start date, so we were able to extend our time on the farm by a few days. Currently, we’re still not sure when we’re going to be starting, but have agreed to get there around the end of next week. The site we’re going to need us to start sooner rather than later, but head office (who doesn’t have to face the farmers) is dragging it’s heals with the paperwork. The idea is that if we’re there, the site managers can then try and nudge head office along. So, we’re now set to leave our lovely little farm on Tuesday morning. 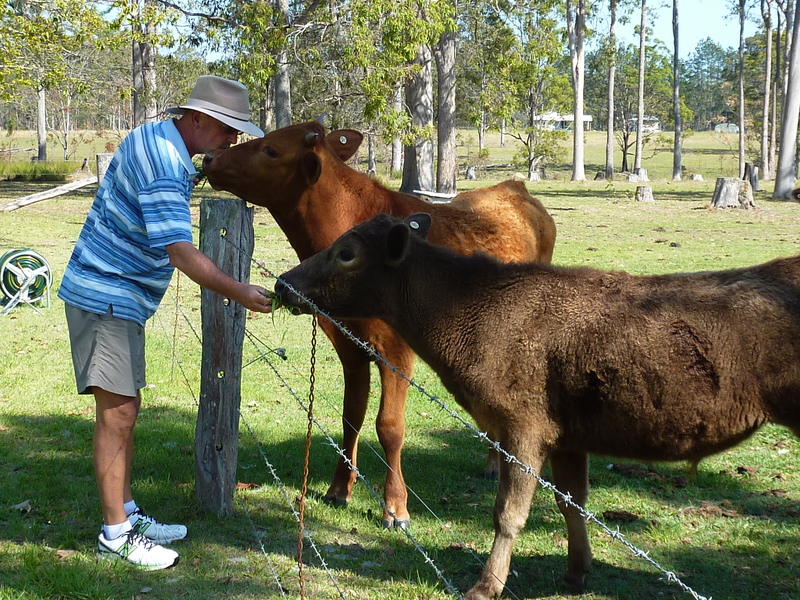 Paul is thrilled that he has managed to get several of the cows eating fresh picked grass out of his hand. We’ve now been here long enough to start giving some of the cows names. So far we have Doe Eyes, Short Horns, Long Horns, and Blue (the four red cows). The two small brown cows we’ve called Murray 1 and Murray 2 – that’s because they’re both of the breed called Murrays I believe. The blacks are harder to identify with the exception of, Testie (so named because he has a huge growth that resembles, you guessed it, a rather large testicle), and the only female is, Missie. Murray 1 and Short Horns enjoying a hand full of lush grass. Short Horns enjoying a bit of a pat. Murray 1, Short Horns and Blue all eat now from Paul’s hand. Some of the others do as well, but those three will always come up for a nibble. Short Horns up until today was tentatively letting let Paul give him a bit of neck rub. Today though he actually seemed to be enjoying it and was making his neck accessible without any sign of reticence. Murray 1 and a couple of the others are just starting to warm to him give their neck a bit of a rub. We’ve been walking out over the farm quite often and have come across two huge rabbit warrens, both of which the dogs are well aware of, unfortunately. They’ve bought home two dead baby rabbits and two dead adult rabbits. We’ve told them off each time, but yesterday we gave them a right good scolding. We managed to catch Riley and severely scolded her while showing her the dead rabbit, and we put her in the old bird coop (which is now the ‘dog house’, for when the dogs need to be put into the ‘dog house’, I believe). Abbey slunk away and hid under our caravan, so she escaped ‘the dog house’, but not a good tongue lashing. They’re both very quiet today, so I think they’re still sulking a bit that their beloved minders got really cross with them. They thought they had us wrapped around their little paws. I’m sure they’re only doing what comes naturally to dogs though. Riley, being foxy cross, is a natural for heading into the burrows to chase the rabbits out. And I’m sure Abbey gets excited by the thrill of the chase when one makes a run for it. But they do seem to look very guilty when they’ve forgotten themselves and dragged their ‘kill’ home for us to discover. Ratbags. We’ve loved staying on the farm. It’s been an experience we wouldn’t have missed. So, thank you to Kaye and Paul for letting us have a share of your little piece of paradise. It’s only been for a short time, but the joy has been immense. We had our medicals for work this week. The first was at the Grafton Medical Centre and took close to two hours each. We were weighed and measured. We were tested for asthma. We had our hearing and sight tested. We had our balance tested. This involved standing barefooted in one spot for 30 seconds with our eyes closed – not as easy as it sounds. We were given a breathalyser to ensure we were alcohol free. All our reflexes were tested and our limbs and joints tested to make sure they all worked well and could rotate in all the directions they’re supposed to rotate in. We had to squat walk across a room, and we had to touch our toes. We provided urine samples which was checked for protein and other possible abnormalities. Our blood pressure was taken, and all our medication checked and noted. Then the appointment was made for two days later for drug screening. We were separately taken into cubicles where we were required to wash our hands without using soap, then presented with a tray of specimen containers and requested to pick one. They weren’t allowed to hand us one! The cubicles had a toilet one side and wash basin the other which were separated by a curtain. On route to the cubical I had to lock my handbag in a cupboard, I wasn’t allowed it with me in the cubical. We were both required to empty our pockets. Then with the curtain half drawn we were required to pee into the container whilst the Dr stood about two feet away on the other side of the curtain making sure we didn’t substitute a drug free sample for our own. Again we had to list all medications both prescription and non prescription that had been taken over the last month. We were again breathalysed for alcohol. It was a surreal type of experience. We think we’ve applied for seasonal work on the wheat silos. It’s usually around an eight week season, the work is laborious, and we’ll be working in hot, dusty conditions. It’s repetitive, unskilled work and is amongst the lowest paid type of work in the country. It’s akin to fruit picking basically. Anyway that’s what we think we’ve applied for. But after the tests we’re not so sure. Perhaps they have us earmarked for something really amazing – perhaps we’ll be working as Rocket Scientists! How absolutely bazaar. The mind boggles…. One year ago today we picked up our rig from Lithgow and headed for Bathurst. The grass was white and crisp on our first morning, and we froze. It’s been a great year. Next week should see us heading for South Australia to do our first bit of work – about 8 – 10 weeks on the wheat silos. Training starts on the 7th October. The season’s short so hopefully bearable. It’ll be a new experience for us both, and that’s what we want now from life – new experiences (preferably ones that have us saying, “what a pleasure!”) We’ve had lots of occasions to say that over the past year, and in fact it’s becoming one of our favourite sayings. The rig has evolved and changed somewhat since we picked it up. We’ve had new lifter legs fitted, new axles and new tyres, by necessity rather than choice. At the same time we had a huge storage compartment fitted to the underneath of the van. It’s like a very big tunnel boot, and holds most of our outdoor furniture. The outdoor table and chairs used to travel on our bed and I was constantly worried what creepy crawlies we were bringing into the van with each pack up. This is proving to be a priceless addition. It’s a massive amount of extra storage and holds a multitude. The two single mattresses have been replaced with a pillow top double recently. It’s very comfortable and better than having the two singles zipped together. Both TVs have been replaced. We’ve changed our original barbecue for a Baby Q, which we love, and this week we bought one of those little portable glass turbo ovens. We’ve only cooked once in that so far – roast pork. The crackle was the best ever, and the potatoes were brown and crisp. Very entertaining to sit outside and watch the pork cooking too. Currently, we’re trialling doing away with some of the seating and increasing our kitchen area. We have seating for 6, yet the kitchen is barely adequate. It makes sense to reduce the seating by two seats, and increase the kitchen and bench space. We haven’t made any permanent changes yet until we check which of two options is the going to be the most suitable. Living in a caravan isn’t free of maintenance or update expenses. Can’t complain though, it’s a lot less than in a house. We’ve put some plans in place for the next year, including a 6 – 8 week trip to the UK and Italy. It’s our 60th in May, so we’ve booked ourselves a 12 night tour of the Amalfi coast through to Puglia (not sure if I’ve spelt that correctly – the heel of Italy’s boot). It’s a small coach tour with only around 16 passengers, and it goes to some main tourist destinations but also quite a few villages that are off the beaten track. We’ve read lots of reviews on different tour companies, and Amber Roads sounds like it’s the real deal. Fingers crossed that our homework pays off and gives us lots of occasions to say, “what a pleasure”. We combining that trip with going to see Paul’s dad and cousins in the UK. It’ll be rather nice to have some time to spend there this time, knowing we don’t have to rush back to work. We’re going to try out the premium economy seats on Cathay Pacific. It’ll cost a bit more, but we’ll forfeit stopovers, so should end up costing around the same all up. It won’t be anywhere near as good as business class of course, but hopefully better than normal economy. Anyway, it’s only money – not that we have that much of that, but what we have is no good to us once we’re gone. We figure about half our life time to earn it, and the other half to spend it sounds about right. Not sure what happens if our maths is way out though, and the 2nd half ends up being greater than the first half – guess there’s still such a thing as ‘pauper’s graves’…. LOL!! !